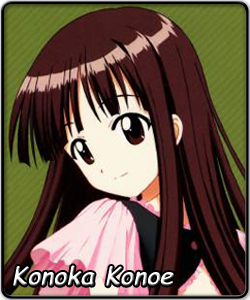 Konoka is the other rich girl of the class of 31 (the first being Ayaka). She is Mahora Academy's principal's granddaughter. Her father was one of Nagi's companions in the famous "Crimson Wing" combat group. Even though you wouldn't guess it if you met her in class, she is a cheerful, easy-going girl who is good at cooking. She talks in Kansai-ben (Osaka accent) and has no trouble fitting in with ordinary (though rather proactive) classmates, showing no trace of her wealthy upbringing. She is best recognised for her multiple layers of relationships with Setsuna. They are childhood friends, but due to events in the past, they became distant. However, their close friendship has been restored – with much subtext.